In which we talk about identifying risk of pest species in light of climate change. Consider these events: a violent home invasion, a major earthquake, and being hit by a ball on a cricket boundary. Which of these are you most at risk from? Obviously this may depend a little on who you are and where you are reading this. Currently, I am sitting at the Ashburton Oval watching my middle son trial for the Under 17 Canterbury cricket team. I am sitting on the boundary at backward of square or cover ( depending on the end being bowled from). I feel like I could be hit by a ball. I have been through a major quake (well several I guess) so that seems like a reasonable level of risk too. I haven't had a home invasion myself but my auntie in a very quiet village in the Catlins was attacked and beaten last week. So that seems like something that could happen too. How to calculate the relative risks? In all of my years of cricket and cricket coaching, I have never been hit by the ball unless I was trying to stop it (although my car window was smashed on the boundary last year). Although I have been through the Canterbury quakes there is no real predicting if there will be another large one in this area anytime soon. Until last week I had never personally known anyone to be attacked in their home. Having a close family member attacked shouldn't change my odds in any way. In order to sort this out I would need to collect data on rates of criminal activity in an area, plate boundary structure and how attentive people are to watching the bowling at cricket. In short, this is a difficult activity for our brains to work through and humans are notoriously bad at assessing risk. This is why we need models and computers to help us out. One area of economic importance where risk needs to be clearly identified is with invasive species. Invasive species are a side effect of economic globalization. As products and people move around the globe there is always an opportunity for unwanted species to go with them. The wrong species establishing in the wrong place can create huge problems, from causing problems for domestic agricultural industries and lowering production to triggering quarantine restrictions for other countries. At Lincoln University we have the Bio-Protection Research Centre that focuses entirely on issues with invasive species. One of the areas of growth is in predicting areas that might be at a higher risk from invasion. (Woah! Almost hit by a ball! Must remember to look up from my iPad more often) Complicating things are issues of climate change. If areas closer to the poles are getting warmer then they are at greater risk from species currently living closer to the equator. Sue Worner from Lincoln, is part of the International Pest Risk Mapping Workgroup, a bunch of like-minded individuals who meet regularly to improve methods of estimating risks posed by invasive species. They have recently put together a special issue in the journal NeoBiota to showcase their findings. Sue is one of the authors of the summary paper that looks at progress in this area. In their introduction article they summaries major findings in pest risk science and: policy (understanding what information is critical in the time available for decisions), climate change (building better scenarios for local change), economics (better estimating the rate of spread of pest species through time), surveillance (developing pest risk maps) and uncertainty ( which arises from a fundamental lack of knowledge about sources of risk). The paper by Sue and her colleagues summarizes these issues and the papers in this issue attempt to develop solutions to these issues and get better at analyzing risk. So are we better at assessing risk because of these models? It seems so. Models are getting more sophisticated and information is more detailed. There is definitely a sense of progress. It probably doesn't help with my original problem so I might just finish up and keep a better eye on the batsman! As a lecturer you spend a lot of time talking to people. With a bit of practice most lecturers can easily fill 50 minutes with facts, figures and opinions. I enjoy talking to students (and enjoy it more when they talk back!). One thing that is a little novel is being interviewed. David Fisher is collecting interviews from staff at Lincoln University and putting them up on a website. David basically guides the conversation along in an attempt to find out about the research that is done at Lincoln University. David interviewed me on Monday and I gushed forth for about 50 minutes. The interview is available here to listen to or download (click on Adrian Paterson research). David starts by asking how I ended up having a louse named after me (Myrsidea patersoni). My answer takes me back to my PhD days when I started researching feather lice on seabirds and then leads through to research on the Chathams that looked at the age and origin of its plants and animals. We also discuss the drowning of New Zealand before moving into better ways to count and kill pest species like possums. 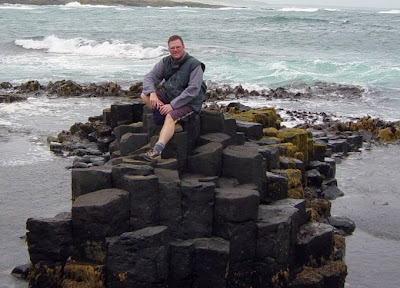 Sitting on the Chathams ready to chat! The scary thing is that when I say at the end "But I've only just started", I am actually stating the truth. I've had over 60 post grads and many colleagues to do science with over the last 20 years and there are lots of interesting research projects I never got anywhere near touching. I guess that is one of the reasons that I helped to start this blog as so much interesting stuff is down around this department that does not get out to the public eye. Anyway, if you want to hear more from me, have a listen. How many birds are killed on NZ roads each year? At last month's EcoTas13 conference, the joint annual conferences of the New Zealand and Australian Ecological Societies, I presented some preliminary calculations of the number of birds killed on New Zealand roads. I've been counting road kill on my bike to work from Christchurch to Lincoln since 2003 so I now have a fairly good idea of how many birds are being killed in this landscape. The rates of birds killed on these roads are similar to statistics from European and North American countries. Extrapolating these out to New Zealand's road network of highways and rural roads suggests that around a million birds could be killed each year. This is much less than the estimated numbers of birds killed each year by mammalian predators throughout the country, but much larger than the numbers of birds killed by the likes of wind farms or the Rena oil spill. Of course, most of the birds killed are exotic species, like blackbirds and house sparrows, since these dominate in and around our towns and cities where most roads and traffic are. Still, native birds appear to be equally vulnerable. This additional source of mortality may be having an impact on native bird species in these habitats which are already struggling to persist in suboptimal and fragmented habitats and with abundant predators. A more detailed analysis of my data will be needed to assess that. You can read the details over on my blog. 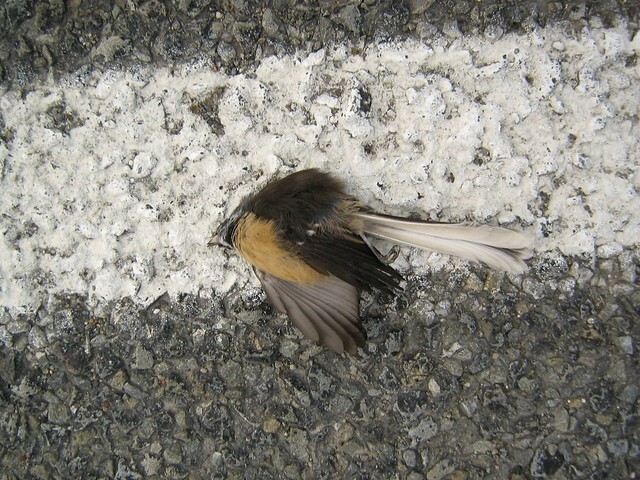 A fantail killed on a busy 80 km/hr stretch of Sparks Road near Halswell, Christchurch (see the associated observation on NatureWatch NZ). In which we look at how possum home range is influenced by density. I have just been home for lunch and found an infestation of 16 year old boys at my house. Most had just completed their last school exam for the year and come to see my son and hang out. All 12 of them! Usually my sons are either on their own or have a friend of two with them when they are at home. When Dad lectures animal behaviour it is always an opportunity to see some of the actions that I teach and research in, well, action. When my sons are on their own they tend to do things like x-boxing, shooting hoops in the driveway, raiding the fridge, play music, watching telly, facebook, annoying brothers/mother/father/cats as they roam around various parts of the house. Sometimes they will leave the house to visit a friend or go to the gym. Add a friend at home and you get similar behaviours but with slightly less movement around the house and less of a likelihood for visiting other friends. When you have an infestation level of 16 year olds you get quite a change in behaviour. The boys tend to congregate in the games room playing pool, xbox or out on the driveway shooting hoops. The boys seldom move into the rest of the house and they seldom leave the property in a big group to visit friends (presumably because most of the friends are here and because not many houses can cope with so many large teens). With my animal behaviour glasses on it looks like the density of the population affects the movement behaviour of the boys. In the wildlife management business, we almost always are concerned with changing the densities of animal populations: reducing density of pests and increasing the densities of threatened species. One of the difficulties involved in altering densities is when behaviours change when numbers in an area drop. 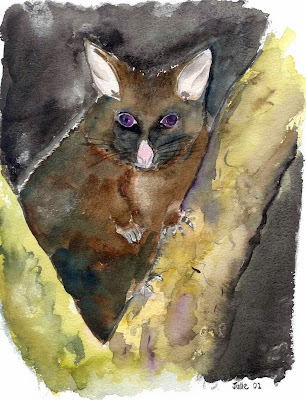 One pest species that we spend a lot of time in trying to reduce in numbers is the brush-tailed possum. This Australian species was introduced into New Zealand over one hundred years ago and has grown to a population in the tens of millions which does enormous damage to native diversity. Possums also carry bovine tuberculosis and can spread the disease through cattle. Hence, possums are public enemy number 1 in New Zealand and are controlled (a polite kiwi way of saying slaughtered) in vast numbers around the country. As we have gotten better at controlling possum populations we have become interested in what happens to their behaviour as population densities decrease. Belinda Whyte has just completed a PhD in the Centre for Wildlife Management and Conservation at Lincoln University. Belinda's research directly examined possum behaviour in populations of different density and her first paper, with her advisors James Ross and Helen Blackie, has been published in Wildlife Research. Belinda's research was mostly centred in the Malvern area of central Canterbury. She had two sites which had low possum densities (1-2/ha) and one site with high densities (7/ha). Live-trap cages were placed in the sites and possums were captured and fitted with GPS collars that allowed Belinda to follow the movement of the individual over the following months. Three times a week individuals were tracked to their den sites (areas where they slept during the day). Population density seemed to make a difference. The two low density sites had possums that behaved similarly to each other but both differed from the high density site. At the low density sites possums had much larger home ranges (9-12 ha compared to 2 ha), more home range overlap (26% compared to 6%) and more den sites (4 compared to 3) than high density possums. So, in low densities possums tend to move around further, potentially interact more with other possums and have several places of safety. These outcomes have important implications for control. By reducing a possum population you will have fewer individuals that can carry and spread TB or eat your favourite native bird species eggs. However, this gain is tempered by the fact that surviving possums will forage further afield, potentially coming in contact with more cattle, and that they are more likely to bump into neighbouring possums and spread the disease amongst the surviviors. So while controlling possums is a useful thing to do it is not as effective as it could be because they change their behaviour as densities decline. So teenage boys and possums seems to have some behaviours in common! Home range behaviours change depending on density of the local population. Let's just hope that urine marking of territory is not one of those behaviours in common or I might not want to go back to my den tonight. Saving the planet, one bottle of wine at a time. This blog post was written by postgraduate student Michael Fake as part of the course, Research Methods in Ecology (Ecol608). Michael revisits a Lincoln University research area that looks at increasing pollinators in vineyards published in 2012. We have entered a period of global declines in both managed and wild pollinator species abundance. If this is not setting off alarm bells in your head it should, as over 30,000 plant species are dependent on pollinators, including a third of the world’s food crops. Pointing fingers gets tricky as more than one factor is involved. However, it is without a doubt that habitat loss due to human activity is the most significant detrimental factor to global pollinator diversity. “Pollinator habitat enhancement: Benefits to other ecosystem services” is a recently published paper which addresses the finer points of the ecosystem services provided by enhancing pollinator habitat. Wratten and colleagues draw attention to the fact these habitats are useful for more than just pollination. They provide a myriad of potential services that should be considered when weighing up the pros and cons of potential Agri-Environmental Schemes. These schemes are already in use in both Europe and America. Many aim at enhancing pollinator conservation and activity by encouraging the establishment of resource rich habitats in agricultural systems. They are frequently reinforced with monetary subsidies and technical guidance for their overall planning and management. It’s in land owners best interests to adopt these pollinator enhancing schemes. As a budding viticulturist and ecologist, I believe New Zealand viticulture is prime territory for such schemes. Vineyards have already been proven to benefit from increased functional biodiversity in the system. For example, the use of selected cover crops can reduce both pest activity and disease pressure as well as a number of other services. On the whole, however, conventional viticulture is that of monocultural crop production, and there exists much room, both figuratively and literally, for improvement in regards to enhancing and harnessing biodiversity in vineyards. Check out these websites for a more comprehensive view of vineyard agro-ecology. Pyramid Valley Vineyards, a first-rate Bio-dynamically managed vineyard and winery from North Canterbury. Agri-environmental schemes would not only help our premium boutique producers continue to attract world attention, but could also result in the creation of more places like this. Image source: personal collection. Bees and other arthropods benefit from habitat enhancement which results in landscapes of high habitat-connectivity and enhanced diversity in structure and species. This is evident as cropping systems in close proximity to natural or semi-natural habitat have increased flower visitation rates compared to un-connected systems. Increasing pollinator diversity not only increases yield, but also facilitates conservation of uncommon plants that share pollinators with widespread plant species. Marlborough: New Zealand's largest viticultural region is dominated by vineyards, mostly of Sauvignon Blanc, yet remnant horticultural and cropping industries are scattered across the region. Source: "Marlborough" 41'47'08.52" S and 173'53'50.91" E. Google Earth. March 1, 2013. Those of you who are botanically savvy will know that grapevines are self-pollinating; therefore enhancing pollinator activity may seem counter-intuitive. But that is really the point. We should begin to think of the effects that our actions will have outside property boundaries. It is likely that vineyards currently serve to reduce pollinator species diversity and activity, as they provide little in terms of food or shelter. Neighboring pollinator-dependent industries stand to benefit from habitat enhancement, as do surrounding native ecosystems through facilitation of ecosystem function. This research highlights many of these potential benefits, as well as biodiversity conservation, soil and water quality protection and rural prosperity and aesthetics. The implementation of AES in NZ viticulture can provide the beginnings of sustainability; not only of the industry itself, but also that of the environment. Having experienced NZ viticulture first-hand, I know that many winegrowers want to be environmentally sustainable. Viticulture, however, like any other industry is driven by cash and profits. Keeping the bean counters happy means that in many cases less than ideal land is developed, or complex vineyard blocking systems are implemented to cover the greatest possible area to maximize yield/ha. Poor-quality land, such as water-logging-prone soils, can produce yields of poor quality and quantity with higher susceptibility to disease. Poorly designed blocking systems can mean improper trellis tension resulting in poor canopy management and subsequent vine damage. I won’t get too much into details, but the increased disease pressure and suboptimal ripening of the crops basically this all spells reduced quality in the pursuit of quantity. AES schemes, if in place, would mean that these areas would not have to be developed. The subsidy would go some way as to cover the costs from reduced yields and the ecosystem services provided by the reserved area would return benefits, both financial and otherwise, to the wider system. These proposed changes would also have a larger effect on the greater NZ wine industry: shifting to quality over quantity parallels the long-term aims of the NZ wine industry of producing premium and truely sustainable, world-class wines. This blog post was written by postgraduate student Catherine Hosted as part of the course, Research Methods in Ecology (Ecol608). 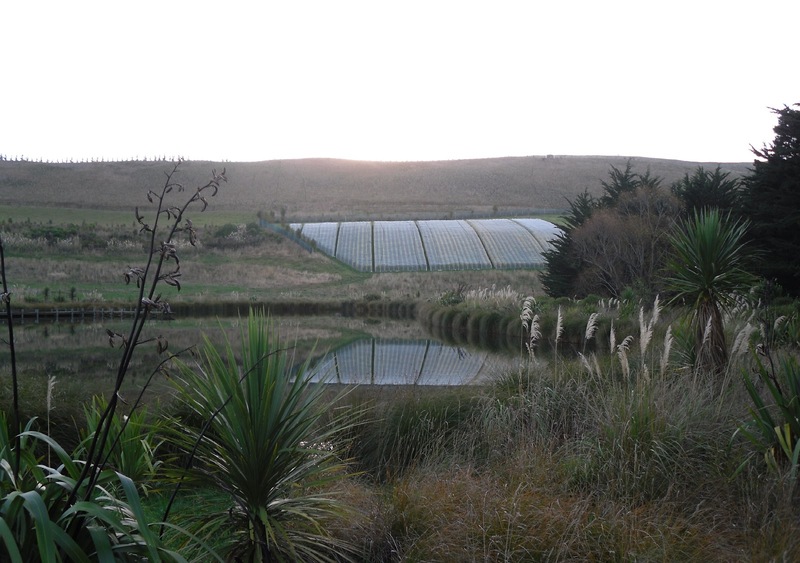 Catherine revisits a Lincoln University research area that looks at urban ecology in Christchurch published in 2010. After getting involved with the current Land Use Recovery Plan for Christchurch, an interest for Urban Ecology began brewing. Much of the new plan seems based on the economic vision of Christchurch and I began to worry about the ecology of our urban environment. Just as it seemed Mother Nature was creeping its way back into the concrete crevices, urban development is poised to strike back. But do not fear! I began to delve into the wonders of Google and found that there is a fight for the maintenance and enhancement of Christchurch’s ecology (such as the Natural Environment Recovery Programme) and the role it will have in the new Christchurch, and it’s looking positive. First, let me enlighten you with the help of work by Lincoln researchers Glenn Stewart, Maria Ignatieva and Colin Meurk into the world of urban ecology and, more specifically, urban ecological networks. The 70’s brought a smell of change in the air: an environmental movement. This movement changed the thinking of urban development to incorporate a more sustainable and green approach to urban living. 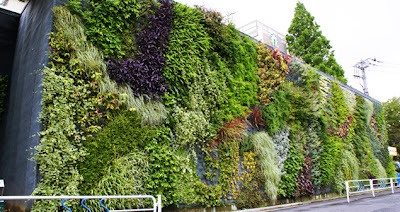 Greenbelts and green fingers (ecological "fashion accessories") running through and around city landscapes began popping up globally. In the USA, greenbelts encouraged migration routes for wildlife and enhanced biodiversity. The smart developers also utilised these greenbelts as a form of public access- creating the term greenways. New Zealand followed the trend and begun to develop many of these ‘hip’ multitasking urban ecological networks. Even so, many of New Zealand’s cities still lack a broader vision of integrated ecological networking. There is growing interest in the use of novel sustainable design solutions (Check these out!) as well as a huge potential for utilising neglected lands (e.g. brownfields) as stepping stones for an ecological network . To create modern ecological networks, there must be an integration of progressive technology and sustainable practices at different scales. And so it seems that Christchurch's shake up (no pun intended....) has given the opportunity for improved urban ecological networking. With the destruction of much of the past urban area, a huge potential for the creation of modern ecological network has arisen. It seems that papers, such as Ignativea et al, have been heard by the urban developers of Christchurch. The current NERP (Natural Environment Recovery Programme) produced to coincide with the LURP (Land Use Recovery Plan) aims to identify ways to rehabilitate and improve the natural environment through the rebuild.NERP'S main goal is to restore the natural environment to a level that can support biodiversity and economic prosperity as well as reconnecting people to our amazing natural features. They aim to make the most of available land (mainly brownfield) to create more forests, parks, gardens and integrate with stormwater and wastewater treatment. To add to this exciting potential, recent research by Glenn Stewart has shown that native biodiversity might not struggle in the battle with concrete and non-native species. This research suggests that over 750,00 native tree, shrubs and other plants have been planted and successfully established over the last decade or so. Thanks to the resurgence in interest of or indigenous flora and fauna, these plants have a good chance to expand into a mixed-origin urban forest. If this is so, then what a great contribution that will be to the ecological networking and biodiversity of the garden city. The urban ecological networking future is looking good for Christchurch, let's just hope these great ideas come to fruition. This blog post was written by postgraduate student Veronica Frans as part of the course, Research Methods in Ecology (Ecol608). Veronica revisits a Lincoln University research area that look at the value of recreational fishing in the Rangitata published in 2004. Many believe that it is the scientist who comes up with the evidence to support saving a given resource. However, to win a conservation battle in the political field, one needs to look at all angles. For Lincoln University’s Geoff Kerr and Glen Greer, focusing on the economic value of the Rangitata River in Canterbury was just the right ticket to get a move on. In particular, they cast a line at recreational fishermen; although environmental factors were also regarded, as it was the everyday person who was the key to solving a conservation conflict. The Rangitata River flows from the Southern Alps and is 120 km long, where it ends at the Pacific Ocean in between Ashburton and Timaru on the East Coast of South Island. The river is used by many for irrigation, swimming, kayaking, boating, bird watching, fishing and other purposes. 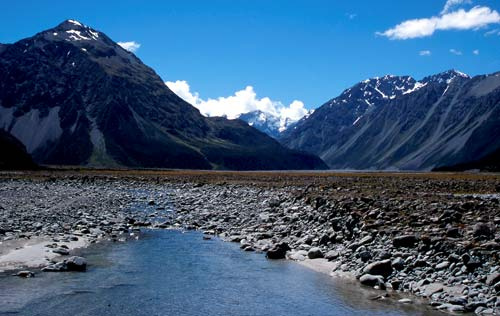 In 1999, New Zealand Fish and Game applied for the Canterbury Regional Council to create a Water Conservation Order for the Rangitata River, but it had yet to be done. A Water Conservation Order is an official recognition by the Minister of the Environment that a particular water body holds some intrinsic or utilitarian value. Once this recognition is in place, restrictions on its use would also apply. This would protect the area in a way that would maintain the stated value, making it a powerful document in terms of conservation. So in order for some water plan to be drafted for this river, its importance first needed to be defined. In response to this, Lincoln’s two professors looked into the economic value behind protecting it. For the economic value to be assessed, the research team phoned angler homes in the year 2000. They asked them about the number of times they visited the river, the distance and costs for travel and how much was spent on gear. It was found that anglers spent some $1100 on about 16 fishing trips to the Rangitata per year. Mid-Canterbury anglers spent about 65% of their time fishing the Rangitata, while those from south Canterbury spent 59% and others spent 36%. In central South Island alone, there were ~1560 licensed anglers, including 1060 from north Canterbury who fished at Rangitata. Basing the survey on 44,000 visits and 36,000 angling days per year, they calculated that some $3 million a year is spent on fishing at Rangitata. What would you do with 3 million dollars? Well, the better question is what would you do if you lost it? Geoff and Glen found that if the quality of the Rangitata and fish stocks were compromised, anglers would travel elsewhere for a better bite and Canterbury’s economy could lose that amount, if not more. Although salmon and trout have been found to have negative impacts on native New Zealand species, recreational fishing has constituted a great part of the economy. Fishing activities only represented two thirds of what people use the Rangitata for, so if other groups that could be potentially impacted by the river's degradation were included, it was predicted that further financial consequences would occur. Since the publication of their paper, a Water Conservation Order for the Rangitata River was finally made in 2006. A tribunal report in 2002 quoted the final evaluations and financial implications from the survey and Geoff Kerr was also one of the many witnesses for the case. It was not only the effort of Lincoln University and their research that won the case, but also the efforts of many other organizations and entities as well. The Rangitata River is the second most heavily fished river for salmon and the third highest fished throughout New Zealand. If it weren’t for these stakeholders—people who care and travel up to 250 km for a cast and are enthusiastic about it—this river wouldn’t be protected the same way it is today. To the anglers out there: thank you for fishing and hope you get a big one next time. 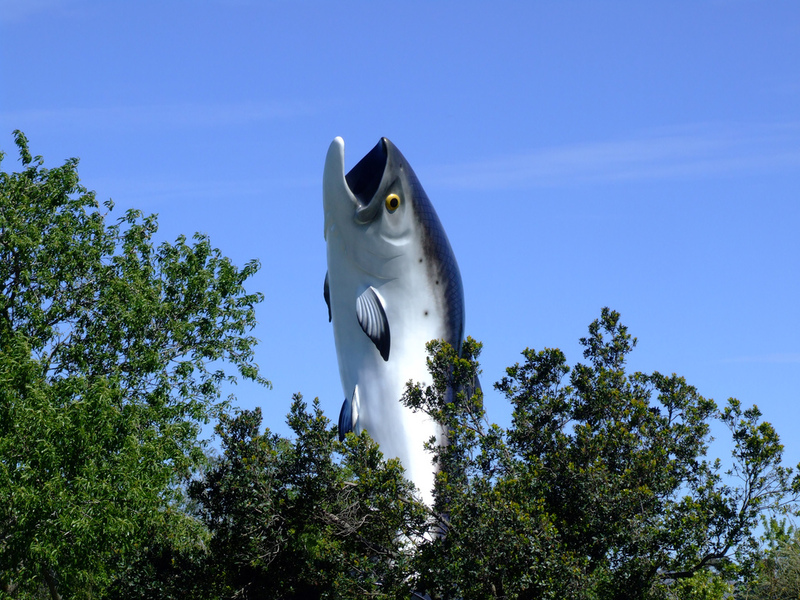 “The Salmon Looms,” by Simon Bisson. More information on Rangitata can be found here. This blog post was written by postgraduate student Elleni Vendras as part of the course, Research Methods in Ecology (Ecol608). Elleni revisits a Lincoln University research area that look at why leaves change colour in autumn published in 2002. Travelling in early autumn through the South Island of New Zealand, made me wonder whether the changing trees I see are native. Most trees with autumn leaf colors seem strikingly familiar to the ones in Europe — an almost unnatural contrast to the green natives here. I found that, indeed, very few natives lose their leaves, and the majority of New Zealand native trees are evergreen. Deciduous trees lose their leaves in preparation for a cold winter (or dry season in the tropics). They don’t photosynthesize over winter when there is not enough water or sunlight for this oxygen and glucose generating process. The chlorophyll in the leaves breaks down and the components move to the stem and branches of the tree. What happens next is the reason why so many people travel to places like Wanaka, Mackenzie Country, Waitaki Valley, and Central Otago (and of course New England in the United States as the most popular place for autumn coloration). They take delight in watching the beautiful autumn coloration: carotenoids – yellow and orange pigments, become visible once all the green chlorophyll is gone. These light-absorbing pigments play a role in photosynthesis and act as a photoprotector for the chlorophyll. Another pigment anthocyanin is responsible for the red autumn coloration. It is produced from glucose during autumn and as a result, leaves from maple, aspens and many others turn into a beautiful red. But, hold on. Why would a tree use energy in producing color pigments in leaves that eventually fall off and wither away? To please Homo sapiens? Certainly not. Scientists believe that these pretty pigments might keep the leaves alive longer by lowering the freezing point and protecting the chlorophyll from photo damage. In that way the leaves might stay longer at the tree and valuable components like glucose or nitrogen can get removed from them and be transported into branches and stem, rather than getting lost with the falling leaves. Others say that anthocyanin may prevent other plant species from growing where the leaves have fallen and decayed. Besides the physiological meaning of autumn colors, Hamilton and Brown advanced in 2001 a hypothesis on the adaptive significance of autumn leaf colors. They proposed that the yellow and red colors in leafs are a signal of the defensive commitment against autumn colonizing aphid species. This theory aroused scientific argument and was refuted a year after publication by David Wilkinson and colleagues, including the Lincoln University-based author, Steven Wratten. They stated that the time of the signal is inappropriate since aphids tend to colonize their host BEFORE leaves fall, so while they are still green and have no anthocyanins produced yet. So why hasn't evolution allowed for leaves to defend themselves just in time? Other studies argue that yellow color actually attracts aphids; some insect traps are even yellow colored. Also it is found that aphids tend to colonize at varying levels on red and yellow leaves depending on the time of the year. Another argument they made was that the changing of leaf colors are strongly environmentally regulated and not linked to insect colonization. Hamilton and Brown’s theory that bright autumn coloration serves as an honest signal of the trees defensive abilities does not convince the criticizing authors especially when it comes to the cost of honesty. This term which is often used in animal behavior research certainly can be used for plants as well. It describes that communication signals need to be costly to be honest and so honest signals have to be handicaps. Otherwise, there’s no reason not to cheat. But, in fact, there is no extra cost for a tree to reveal yellow leaf color. So how about red autumn coloration, since this signal is produced in autumn? Are red pigments with their antioxidant abilities just used as another sunscreen complementing the already available yellow carotenoids? Another alternative explanation for their presence offered by the authors is that red leaves absorb more light and energy allowing photosynthesis to happen under harsh conditions. It’s amazing that something simple that we look at each year is still not well understood. The jury is still out on aphids and red leaves. Marco Archetti found out that aphids tend to avoid red-leaved apple trees and are less fit than those on green leaves. London-based scientists revealed that although aphids lack a red photoreceptor, they may be able to differentiate between green and red leaves and certainly find yellow leaves the most attractive. While in carnivorous plant species the red anthocyanins tend to attract insects. What a confusing mess of contradictions! But that’s science for you. The journey to the truth rarely follows a straight line. And so scientists continue to do what they have always done: research and debate. Either way, trees in New Zealand can count themselves lucky. While they have to cope with 122 aphid species, trees in Poland have to fight 500 more. By the way, in those latitudes autumn colors are much more striking as well. This blog post was written by postgraduate student Jenny Brookes as part of the course, Research Methods in Ecology (Ecol608). Jenny revisits a Lincoln University research area that look at using fungus to kill insect pests published in 2011. Writing a blog has proved more difficult than I remembered. Having a done previous blog in 2011 entitled jennysinsectcorner, I recall it as being easier than this one!!! Or perhaps memories fade. The brief for this blog was to base it on a research paper written by a staff member or student of Lincoln University at the time of publication. The paper I chose was ‘Persistence of Beauveria bassiana (Ascomycota:Hypocreales) as an endophyte following inoculation of radiata pine seed and seedlings’ which was written by four authors, including Professor Travis Glare of Lincoln University. Reading the paper has re-enforced my view of how incredible fungi can be. 3. Able to not just deter but to kill insects. Beauveria bassiana (photo 1) can be endophytic in several plant species. The idea is to inoculate a target plant, for example pines trees (photo 2,) and then when the trees are attacked by insects, the fungus will kill or deter those insects. Two Beauveria bassiana isolates (F647 and F668) were found in mature wild pine trees (Pinus radiata) and were used to inoculate pine tree seedlings by two methods-Seed coating and root dipping. A CLOSER LOOK AT HOW BEAUVERIA SPECIES INVADE. 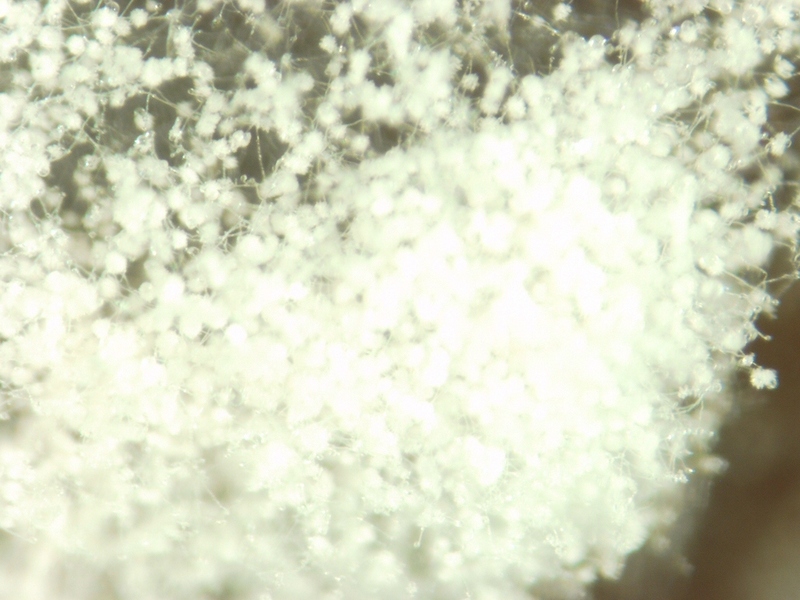 This raises more interesting questions of how a fungus can kill an insect. Infection occurs when conidia (the spores) land on the insect and germinate. 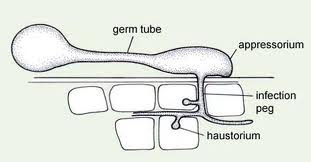 The spore grows a germ tube and a special blob called an appressorium (Diagram 3) which penetrates the insect cuticle at the junction of plates in the insect's exoskeleton called sclerites. Diagram 3; Courtesy of APSnet illustrating the infection process in a plant. The germ tube grows into the appressorium then penetrates the cells. This is in a plant but the same principle works in insects penetrating the haemocoel or insect blood system. The fungus invades deeper into the insect and eventually causes death. This is the trigger for Beauveria to make spores (sporulate) and protrudes outside the insect to release spores to continue its life cycle. 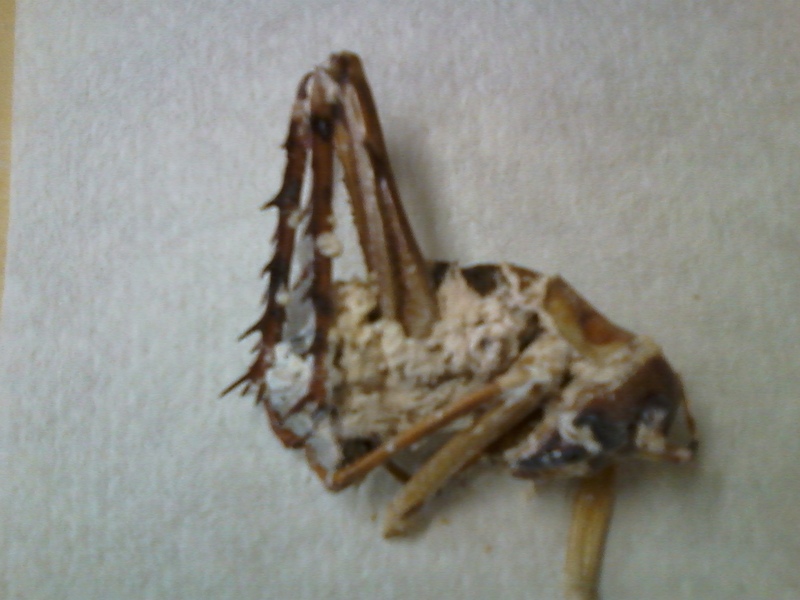 The poor unfortunate insect is eaten from within; a long and slow death (photo.4). It could be considered a cruel and barbaric death. The fungi steals the ‘goodies’ out of the haemocoel and spreads slowly through the insect avoiding organs that will kill the insect prematurely. Even after the insects death it will continue to spread until there is nothing left and then it will protrude outside and sporulate. If this happened to us , this could be considered torture or worse. We see in photo 4 a weta which has been killed by a natural infection of Beauveria bassiana found in the wild and given to Professor T. Glare by a colleague. The insect killing skills of Beauveria are now being put to good use in bio-controls worldwide. It was used by USA to control fire ants. Cornell University did a study with grasshoppers and found that at lower temperatures, mortality of the grasshoppers increased. Regardless of how cruel the insect world may be our society prefers to have natural solutions to man-made problems. Just two of many Beauveria-based commercial products developed so far are called Beaublast and Beaugenic made by a company in the North Island, New Zealand. I believe we will see more natural products especially fungal based, what do you think? Would you hire fungal killers to kill your insect pests? Links to more sites for Beauveria bassiana you may want to explore. This blog post was written by postgraduate student Helene Rohl as part of the course, Research Methods in Ecology (Ecol608). Helene revisits a Lincoln University research area that look at the risks that waste has for kea published in 1998. Kea are the only true mountain parrots in the world and are endemic to (only found in) the Southern Alps of New Zealand. Kea belong to the most intelligent bird group in the world, but sometimes their cleverness is counterproductive. Some smart kea, for example, have learned to open the lids of rubbish bins to get to all the 'delicious' scraps we throw away. That this isn't healthy for them is probably obvious to every reader. But, what you may not know, is that people's favorite treat, chocolate, caused the death of an innocent, healthy kea at Aoraki/Mt Cook Village. Brett Gartrell from the New Zealand Wildlife Health Centre at Palmerston North and Chris Reid from the School of Biological Sciences at Wellington found this unfortunate fact during their examination of a dead kea and published their findings in the New Zealand Veterinary Journal in 2007. 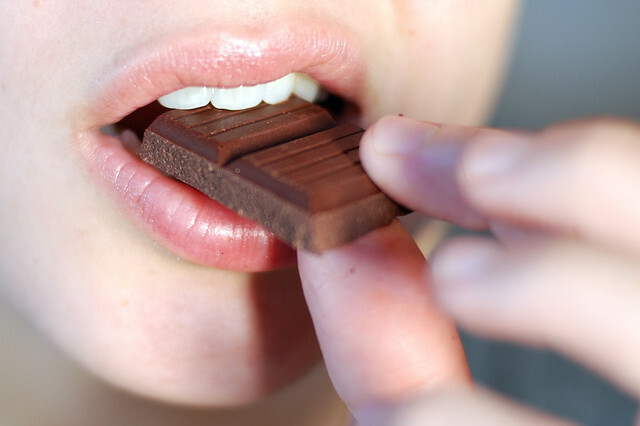 Chocolate, especially the dark variety used for cooking, contains natural toxins (theobromine, caffeine and theophylline) that can be lethal, if consumed in high doses. It seems that the 20 grams of chocolate that the adult male kea had eaten, was too much for the poor chap. Although this is the first reported case of a wild parrot dying due to chocolate consumption, the toxicity of chocolate to animals is not unknown. It has already been shown that chocolate can cause death in dogs. Rubbish bins aren't the only human food source jeopardizing kea. Other curious kea prefer to explore the places where our scraps eventually end up: rubbish dumps. This sounds even more harmful compared to just one rubbish bin which is why Mark Jarrett investigated rubbush dump dangers for kea in his Master thesis at Lincoln University in 1998 . Mark discovered that some kea at the Arthur's Pass rubbish dump suffered from lead poisoning. The source of lead poisoning isn't necessarily the rubbish dump itself. It is more likely that the attractive source for lead poisoning are nail heads in huts or other building materials which are found outside of the rubbish tips. The rubbish dumps, concludes Mark Jarrett, may pose a threat to individual kea, but don't endanger whole kea populations, since only young and unexperienced kea get injured or die. In fact, human food is a danger to kea in several ways: First, kea are mostly vegetarians, eating mainly roots, bulbs, leaves or fruits and occasionally some insects. But the human waste that they eat contains a lot of fat and sugar, doing the kea no good (as it does, by the way, to us humans, too!). Second, if young kea don't learn how to search for natural food (because they rely on our scraps) they may starve when they can't find something eatable in winter. Third, if leftovers or rubbish are easy accessible for kea, it may act as an invitation to explore the place, leading to more mischievous behaviour and risk of accident. 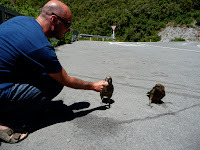 Another chapter of human and kea food associations is the feeding of wild kea, especially by tourists. Kea enchant the unknowing among us with their cheekiness and beauty. And before you can say 'tasty treat' tourists end up giving cookies to these clowns of the sky, ignoring happily the 'don't feed the kea' sign. So for the future bear in mind: Keep kea away from chocolate! They aren't bird-brained at all, but human food does them no good. Jarrett, M.I. 1998. 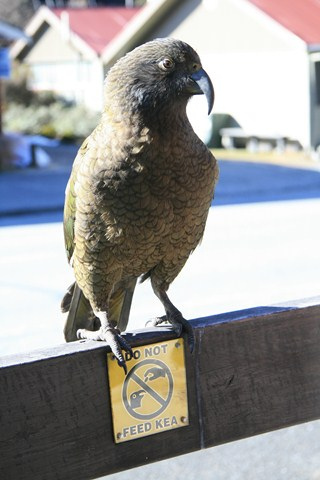 Hazards to kea (Nestor notabilis) at rubbish dumps. Lincoln University, Lincoln, New Zealand. Gartrell, B.D. ; Reid, C. 2007. Death by chocolate: A fatal problem for an inquisitive wild parrot. New Zealand Veterinary Journal 55: 149-151. Bringing home the bacon - Male kea and their unusally big beaks. This blog post was written by postgraduate student Jenny Dent as part of the course, Research Methods in Ecology (Ecol608). Jenny revisits a Lincoln University research area that looks atthe differences between males and females published way back in 1991. "Argh, he's attacking the thermos!!" 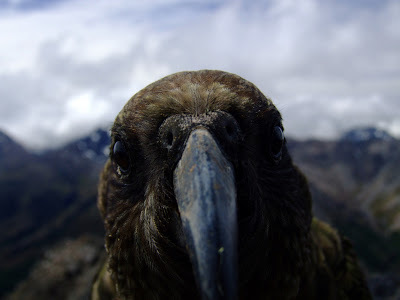 This particular tourist doesn't seem overly thrilled about his first kea encounter. To be fair, said kea isn't exactly making a stella first impression. Dismantling someone's lunch is never a good icebreaker. But what basis did this tourist have for assuming that the offending kea was in fact a Mr Kea? Why not a curious Mrs Kea? Chances are he had no idea (nor did he look like he cared terribly much) but he's certainly not alone. In fact, many of New Zealand's early taxonomists were in the same boat. There was a widespread belief amongst New Zealand's early taxonomists that male and female kea could be told apart by their appearance. The problem was that no one was exactly sure HOW they could be told apart. They all had their theories of course, but for the most part these were vague and poorly tested. My personal favourite was the assertion that males could be identified by their "aggressive demeanour". Surprisingly there was no quantitative assessment of the difference in size between sexes (called sexual dimorphism) in kea until 1991 when Alan Bond, Kerry-Jayne Wilson and Judy Diamond took it upon themselves to solve this conundrum once and for all. Their findings confirmed that kea do express a degree of sexual dimorphism. Males are about 5% larger overall, and, even more impressively, have upper bills which are 12-14% longer than their female counterparts. Now this difference may not seem like much, especially when you consider some of nature's more extreme examples of sexual dimorphism - but for a parrot species this is actually pretty extraordinary. Sexual dimorphism (differences between the sexes) relating to size is only found in seven of the 81 parrot genera. Furthermore, at the time of this study, only one other parrot - the Palm Cockatoo - was known to have bill size dimorphism greater than the overall difference in body size. Its no surprise then, that researchers were pretty keen to see if this uniqueness extended to the only other species in this genus, the kaka. It would appear that it does. In 1999, Ron Moorehouse and his colleagues were able to demonstrate the presence of bill size dimorphism in the North Island Kaka. The level of dimorphism that they observed was very similar to that observed in kea, with male bills being 14% longer on average. Because of this similarity, and the rarity of the condition overall, there is thought to be a phylogenetic basis for this condition. In other words, it is assumed that kea and kaka have inherited this trait from a common ancestor. With this new discovery in mind, researchers set about trying to explain how bill size differences could have arisen. The little evidence available seems to suggest that it may have arisen as a result of differential niche utilisation (a fancy term for the specialisation of male and females for different roles). In both kea and kaka, the females take on most of the chick-rearing responsibilities and the males assist by provisioning the female and chicks with food. Essentially Mrs Kea becomes a stay-at-home mum and Mr Kea is the breadwinner – think 1950's gender roles. Bond, A.B., Wilson, K.J. & Diamond, J. (1991) Sexual dimorphism in kea Nestor notabilis. EMU, 91, 12-19. Moorehouse, R. J., Sibley, M.J., Lloyd, B.D. & Greene, T.C. (1999) Sexual dimorphism in the north island kaka Nestor meridionalis septentrionalis: selection for enhanced male provisioning ability? Ibis, 144, 644-651. 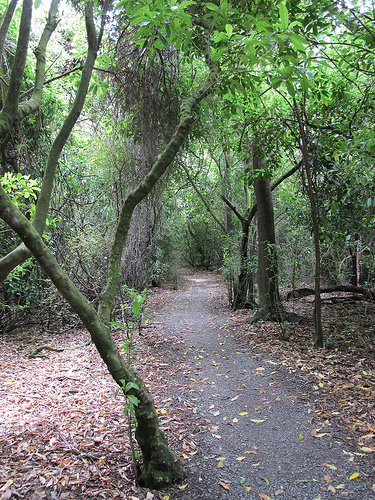 Can natives species make a comeback in Christchurch's urban woodlands? This blog post was written by postgraduate student Denise Ford as part of the course, Research Methods in Ecology (Ecol608). Denise revisits a Lincoln University research area that measures the re-emergence of indigenous forest in Christchurch published in 2004. Can Christchurch move away from the image of an "English garden city" to a city which reflects its indigenous natural heritage? Research on the regeneration of native species within urban Christchurch has shown definite signs that indigenous forest can reappear in the city. This move then, may well depend on changes to the cultural and aesthetic values held by many Christchurch citizens. The city of Christchurch was a planned English settlement and, in the 150 plus years since the arrival of the first settlers, it has developed into a typical western urban centre. The need for familiarity, nostalgia and shelter on an exposed Canterbury site meant that much of the urban habitat became reflections of English country gardens and parks. The indigenous flora was replaced by exotic species. Trees from Europe, North America, Australia, Asia and Africa now dominate the woodlands of the city. Some pre-colonial plants survived in small pockets in and around the city but in a much reduced form. In 1993 the Christchurch City Council recognized the high ecological value of many of these remnant patches and designated them as ecological heritage sites. The Kahikatea (Dacrycarpus dacrydioides) forest at Riccarton Bush is one site identified. The bush is a small remnant of podocarp forest which has survived Polynesian settlement and 150 years of urbanisation. In the last decade over a million indigenous trees, shrubs, tussocks and wetland plants have been planted in the city, not without controversy from some sectors of the community. The Christchurch City Council is actively involved in the protection and restoration of remnant areas, Travis Wetland being one example. The ongoing restoration of such sites and the inclusion of native plants in public and private land along with earlier plantings of native podocarps form a seed source from which dispersal and regeneration can occur. Glenn Stewart and his colleagues, Maria Ignatieva, Colin Meurk and Richard Earl, examined the exotic and indigenous shrub and tree components of urban Christchurch and how it affected the food and habitat of native birds. 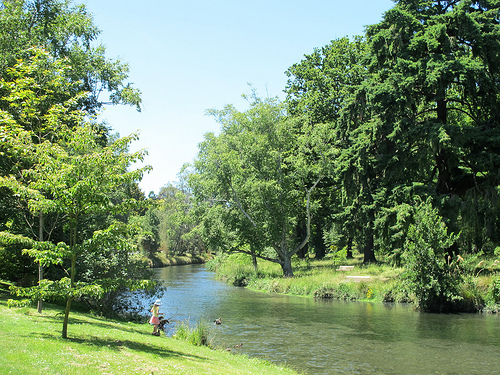 Their investigations of records kept by the Christchurch City Council showed that over 80% of the 50,000 plus trees planted in the cities parks and streets by local government were exotic. Most of these exotic trees are dry fruit bearing and have no or little value as a high energy food for native wildlife. In contrast to public areas, suburban gardens contained a greater proportion of native woody plants. The majority of native plants in the city are those that produce fleshy fruits and nectar which are important food sources for native birds, lizards and invertebrates. Glen and his colleagues were also interested in the regeneration rates of exotic and indigenous vegetation within the city. They sampled parks and suburban gardens, finding a significantly higher number of indigenous seedlings than exotic woody species. This difference may be explained by seed dispersal in which wind and birds play an important role. Many wind dispersed exotics in the city have poor dispersal ability, whereas native species, such as lowland ribbonwood (Plagianthus regius) and akeake (Dodonaea viscosa), have light seeds that can travel long distances. Seedlings are quite often found under trees where birds have perched and passed the fruit they have eaten. Only 26% of exotic species have edible fruit compared with 78% of indigenous species. With an available seed source and the regeneration ability of indigenous species there are positive indications that the re-emergence of an indigenous-dominant woodland forest is possible. Of course sociological factors will also come into play; many citizens are comfortable with the English nature of our city and are reluctant to see a dominance of indigenous species. This study is very pertinent to Christchurch in 2013 given the abandonment of land in the residential red zone following a series of major earthquakes in 2010 and 2011. Map of the Residential Red Zone. 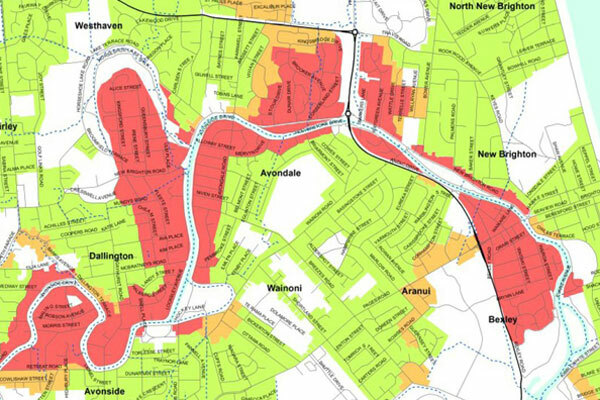 The land in red has been deemed unsuitable for rebuilding. In September 2012 a survey of indigenous and exotic seedling regeneration was conducted in nine suburbs (a total of 90 properties) in the red zone. The results of this survey indicated that seedling regeneration was following the preliminary seedling study done by Glenn and his colleagues in 2004. The number of indigenous seedlings found was considerably higher that the number of exotic seedlings. The two most numerous seedlings were indigenous; Kohukohu Pittosporum tenuifolium, and Cabbage trees (Cordyline australis). With the abandonment of properties, gardening practices such as weeding and mowing no longer occur. This 'neglect' has allowed, in some cases, the proliferation of indigenous species. Is this an opportunity, with control of aggressive exotics, to see the transformation of a Christchurch urban woodland "to a new kind of indigenous-dominant forest biotype" as envisaged by authors of the 2004 paper? The red zone opportunity will not only benefit the indigenous plant biodiversity of the city but will allow our native wildlife to make a comeback. I am looking forward to a city that represents the natural fauna and flora of the area and the cultural sense of being that it will bring. Check out Glenn's blog Natural disasters and the nature of cities regarding the Canterbury earthquakes and subsequent vegetation dynamics in the residential "red zone". Stewart, G. H., Ignatieva, M. E., Meurk, C. D., & Earl, R. D. (2004). The re-emergence of indigenous forest in an urban environment Christchurch, New Zealand. Urban Forestry & Urban Greening, 2, 149-158.